70’s rock had a revival during the latest ten years, but what is it that makes a band stand out in today’s great variety of this kind of rock? Is it the uncompromising rawness of the blues-based Sabbath riffs that once was written? Is it the vintage speakers and instrument, combined with pure analogue recording that the commercial scene lacks? Or is it just spelled CAPTAIN CRIMSON? Four enthusiasts from Örebro, Sweden, have managed to shape a palette of blues-based rock with heavy, fuzzy elements. The result is a full-length album called “Dancing Madly Backwards” and recollects the tunes of GRAVEYARD, WITCHCRAFT, MOUNTAIN and LEAF HOUND. CAPTAIN CRIMSON also features Stefan Norén from BLOWBACK, who released “800 Miles” on Transubstans in 2010. As the band says: “We guarantee you that this album makes you swing your head to the beat of the music and fill you with euphoria that many bands lack.” No more needs to be said. 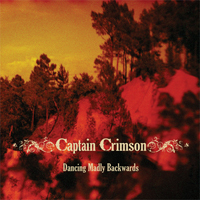 “Dancing Madly Backwards” was released on Transubstans Records in the end of August.